Gil and I have started our own 4th of July tradition. While we knew we had great views here, we had no idea what was in store during our first 4th of July. Fireworks are legal (weather permitting) which allowed neighbors to launch their own fireworks along with the city’s own fireworks display. Wherever we looked we could see bright colors shooting into the sky. We grabbed a picnic blanket and our food and a new tradition of watching fireworks from our backyard was born. When we celebrate the 4th, we usually have a cookout at the fire pit. This year, we’ll be following up our meal with an awesome ice cream bar. Fitting the patriotic theme, I decided to create a red, white and blue themed ice cream sundae bar using candies from SweetWorks. 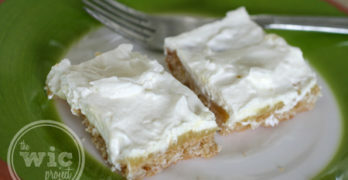 This will be the perfect treat to help unwind after a day at the lake. SweetWorks has a variety of chocolates and candies that are perfect for adding some red, white, and blues to your next 4th of July BBQ. For our ice cream bar, we used SweetWorks Sixlets, which are colorfully coated chocolate balls, crunchy candy crumbles, and gumballs. SweetWorks candies aren’t just for topping sundaes and cupcakes. To help decorate for our SweetWorks ice cream topping bar, I used SweetWorks red and blue Sixlets, and a bit of blue painter’s tape, to make a fun DIY, chocolate candy streamer. The individual plastic Sixlets bags made it easy to attach them to the tape. Kids (or adults) can just “grab” a piece of the stream for some chocolate Sixlets. 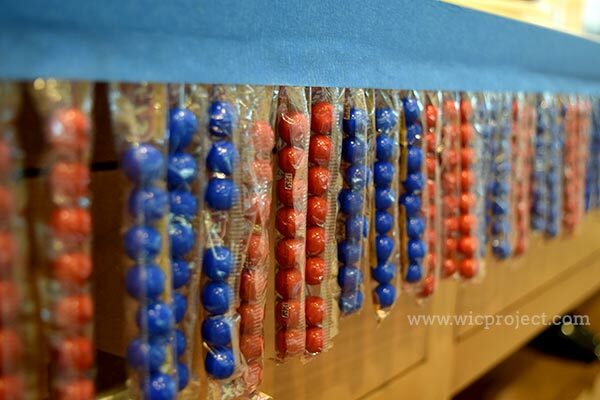 I love how SweetWorks makes it easy to add some 4th of July colors and decoration to any event or sweet treat. 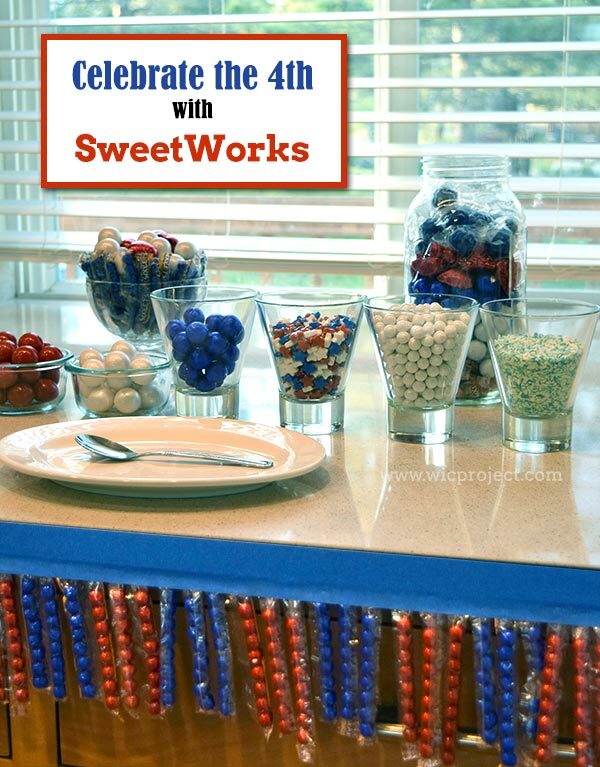 How would you use SweetWorks candy at your next 4th of July gathering? We’re excited to bring you not 1, but 25 chances to win $50 worth of SweetWorks candies for you to enjoy this 4th. 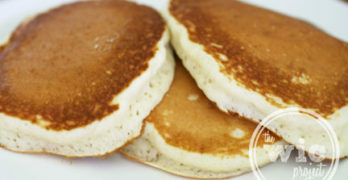 Enter our giveaway below and then hop to the next blog for another SweetWorks giveaway to enter! I think If I had the Ovation® Milk Pumpkin Spice Break-A-Part, I’d use it to decorate my pumpkin cheesecake- it’d be so cute! I think your idea of an ice cream bar is genius! I could make homemade ice cream, and use the chocolates for toppings. We watch the town fireworks from a bedroom window. I would like to use Sweetworks’ Red, White and Blue Mix Stars Sweet Shapes on the 4th of July cake I’m baking for our family picnic. I like the Neon Stars Candy because it is ideal for the 4th of July celebration. I would use the Red and Blue Sixlets to decorate my cake. I like the Hot Cinnamon Jawbreaker because they taste good. 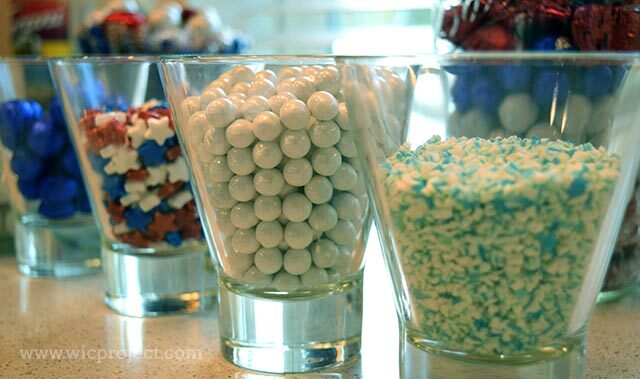 I would use the red white and blue mix stars sweet shapes and put them in nice glass bowls for table decorations. I’d like to use the Sixlets. They have always been my favorites and bring back memories of my childhood! I would use sixlets to decorate a cake for my sons birthday which is on the 4th of July! I would use Sixlets® King Size. I like chocolate flavored candy. I would use the Sixlets. They come in so many great colors and taste good too! I like the gumballs because they come in so many different colors which makes it easy to match décor. I would love to use the red, white, and blue Sixlets and pearls for the 4th. They would be cute in bowls or on cupcakes. I would get the Red, White & Blue Mix Sixlets® Peg Pouch & use them to decorate cupcakes for our 4th of July celebration because they are so festive & perfect for the 4th! I would be using Sixlets because I love them! I used to go to a little penny candy store and I always bought lots of Sixlets!! 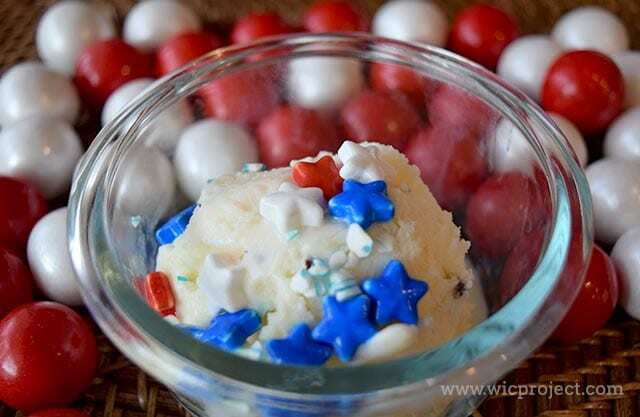 The Red, White and Blue Mix Stars Sweet Shapes™ would be great for Independence Day!!! The colors & shapes are perfect!!! I would use Sixlets for color, Niagara Chocolate caramel Bars because I love them, Break-Aparts because they are great, too, and maybe the Candy crumbles, too. They would be great on cookies! I would use the powder blue and white and the red and white candy crumbles to make cookies. My kids love the crushed candy cane cookies I make at Christmas and this would be a great summer version. I want to use the Red, White and Blue Mix Stars Sweet Shapes on a white cake, it would look so good. Red & White Candy Crumble Jar because they are festive. I would like to use the Red, White, Pink Hearts Sweet Shapes and use them on cupcakes for Valentines Day. Your sixlets streamer was pretty awesome. I would use the nerds to decorate because the colors are bright and cheery and the shape has a lot of fun textures. (okay, I would actually just eat them. I like nerds). I would love to use Halloween Mix Sixlets® (2lb Bag). I bet they would look great in a jar and add a nice pop of color to the table! I’d use Sixlets, Pearls, and Candy Crumbles on cupcakes for the 4th of July. Why? The kids love candy and these are edible decorations. I would use Niagra Chocolates because YUM! I would love to have the red, white and blue stars to add to my strawberry trifle that I make for our 4th of July picnic! the red white and blue sixlets! I would love to use the red white & blue Sixlets to decorate with because my kiddo’s would easily be able to help create something spectacular with these! Sixlets would also give an amazing “pop” of color that would be yummy to eat as well! I would love to use the Oak Leaf. I would use Sixlets. They are colorful and taste good. I would love to use the dark green and lime green sixlets for decorating my nephews teenage mutant ninja turtle bday cake next month. It would be fun to decorate with the Foiled Solid Milk Balls in various colors for each holiday. They would be pretty in large clear vases or jars. I’d use gumballs because there is such a big variety to choose from and you could do so many things with them. I would use the Gumballs Filled With Nerds because they are fun and colorful and my kids love Nerds! Thank you for the giveaway. I’d love to use the Red-White-Blue everything to make table centerpiece decorations for my sons upcoming Eagle Scout ceremony. The cinnamon jawbreakers would be good. I’d love to use the Ovation Mint Sticks. They are quite universal. They could be used whole as they are, broken in half or quartered to make other types of decorations, or even crumbled as a topping (or even snacked on in between). I think they’d be perfect! I would use the Sixlets to decorate my cupcakes. They come in so many great colors and taste yummy too. I would have to use a variety of Shimmer Turquoise Sixlets and Lime Green & White Candy Crumble for my brother and sister-in-laws upcoming wedding reception because they are the perfect colors and would go great on the center of the tables! I would use sixlets. They are small enough to not worry about little ones choking on them, and they are tasty too!!!! I’d use sixlets because I love them! I would use sixlets and gumballs because they are colorful. I would use the Niagara Chocolates – Foiled Solid Milk Chocolate Rabbit and make a cute table topper center piece. I think it would be fun to use the aquarium candy and the smiles candy and let all the little ones decorate cupcakes on the 4th! I would use tie dye sixlets to make a booming disply of fireworks on my cake. I love Sixlets so I would absolutely use those in my decorating. Thanks for the chance to win! I would use the red, white, and blue Sixlets for holiday desserts. My family loves them! I would use the silver star candy to decorate my granddaughter’s 1st Birthday cake. Her birthday is the 4th of July and her middle name is Star. I would use Sixlets® (25 lbs)to decorate all my baked goods because I want them to look pretty and have lots of color. I would decorate with Sixlets! They are so colorful and perfect for the 4th and they are DELICIOUS! love to use the sixlets and decorate some cupcakes. i would get the Neon Stars Candy (15 lbs) .my sister just graduated high school and shes having a graduation party . i would use these for decorations on the tables because after she graduated, i told her to reach for the stars.